Enhancing its services to offer a comprehensive banking experience, Seylan Bank Trade Services has pioneered the concept of priority banking by establishing a Priority Counter for its trade clients. Offered to selected clients based on the volumes routed through the bank, the new counter offers accelerated document collection on a priority basis. As a first step, the bank has selected 50 top trade clients, whose day to day trade operations will be processed through the priority counter. Furthermore, customers can avail the privileges of the Priority Counter by producing the ‘Trade Loyalty Card’ issued by the bank. 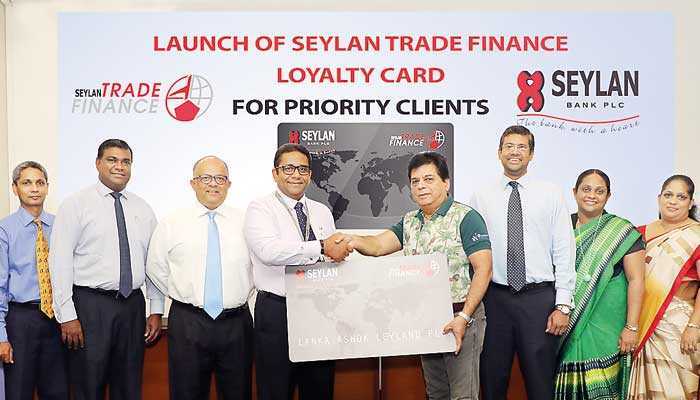 In addition, other added benefits attached to the Trade Loyalty Card enables employees attached to Institutions to enjoy special concessions on Seylan personal and housing loans, where the first year annual fee and joining fee waived off for Seylan Credit Cards. Over the years, Seylan Bank Trade Services Department has taken numerous initiatives to facilitate both SME and Corporate sectors. Seylan Bank Trade Services offers a variety of facilities, ranging from structuring facilities, issuing Letters of Credit, advising and negotiation of Export Letters of Credit, funding needs of clients in local and foreign currency. The bank has a global network of over 500 banks spreading across 100 countries for international correspondence to serve the requirements of trade clients. The bank’s wealth of experience along with its continues commitment to evolve and train its employees to advice clients on the right approach has enabled Seylan Bank to go beyond banking and set a benchmark in the trade services category.